Contrary to what many people believe, the flu is not just a bad cold or a stomach bug. It's a serious respiratory illness that kills as many as 56,000 people every year in the United States. The majority of these deaths are believed to be in people over age 65 years old, but on average more than 100 children die each year from flu, and very young children are especially vulnerable to potentially deadly flu-related complications like pneumonia or sepsis. If you're a parent or guardian of a small child or infant, here's what you need to know about how you can die from flu and what warning signs to watch for if your child becomes ill. Many flu-related deaths aren't the direct result of the viral infection, but rather a consequence of a complicated series of reactions set off by the virus. In some cases, the flu makes existing medical issues worse or opens the door for new ones, but in other cases, our own body's response to the virus is what deals the fatal blow. Many of the things associated with the flu-like body aches or fever—are actually our own body’s reaction to invaders. When we get infected with germs like viruses or bacteria, our body’s immune system engages in several different ways to launch an attack. Increasing our temperature (fever), for example, is our body’s way of trying to kill off invaders who can’t survive in an overheated environment. Another way bodies defend themselves is by sending foot soldiers known as cytokines. These proteins made by immune cells — think white blood cells — are primarily designed to stop the virus from spreading by attaching themselves to the invaders and by affecting how our own cells operate. In some cases, the body can overreact to an infection like the flu and send out a flurry of cytokines in what is known as a “cytokine storm.” When that happens, the immune system can spin out of control, causing widespread inflammation and harming our own body’s cells and tissues. In some cases, this can lead to fatal organ failure or sepsis. Sometimes the flu can leave you vulnerable to other kinds of infections, most notably pneumonia or strep caused by bacteria. Under normal healthy conditions, the immune system might be able to fight off these infections without any issue, but flu-weary bodies have a harder time defending themselves. Like with a flu infection, a secondary infection can spark an over-reactive immune response or cause organs like the heart or lungs to shut down. For individuals with existing medical conditions, the flu virus can make already bad health issues worse. Children with asthma, for example, have swollen and sensitive airways that can make it harder to breathe. If they become infected with the flu, the virus can cause these already restricted airways to become even more inflamed, triggering asthma attacks or making them more susceptible to secondary infections like pneumonia. Individuals with underlying medical conditions, such as asthma, neurological conditions, lung or heart disease, or weakened immune systems due to diseases (like HIV) or medical treatment (like chemotherapy). It's important to note that while these individuals are more susceptible to severe flu, they aren't the only ones who can die from the virus. Healthy children and adults with no history of medical issues can and have died from the flu and flu-related complications. In fact, from 2010-2016, half of all kids who died from flu had no preexisting medical condition. While most healthy kids are able to recover from the flu just fine at home, some need more medical attention. Studies show that nearly two-thirds of children who died from flu from 2010-2016 did so within just a week of having symptoms, so spotting warning signs early is critical. If you notice any of the following signs or symptoms, call your child’s primary care provider immediately or seek medical attention right away. Spiking a temperature is a pretty standard symptom of the flu. Fevers are one of the ways our bodies try to fight off diseases, and they can actually be helpful when you’re in the midst of an infection. But having a very high fever for days at a time can start to cause damage to the body and be a sign that more help is needed. 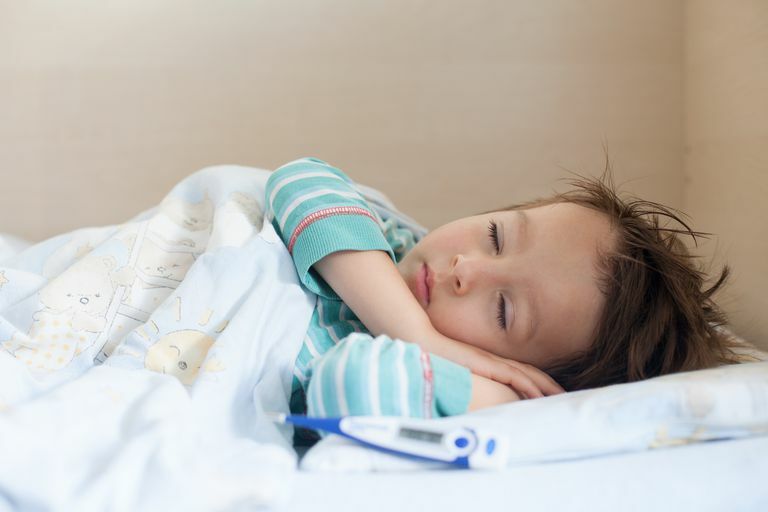 If you're worried your child's temperature is too high, or if they start to have seizures from the fever, call your child's doctor immediately. The flu is a respiratory illness, so it’s important to watch for signs that your child isn’t breathing properly. If your child seems short of breath or is breathing too quickly, or they appear to be turning blue, it can be a potentially serious indication that they have a complication like pneumonia and/or that their body isn’t getting enough oxygen—and our brains, heart, and muscles need oxygen to carry out our daily functions. Without it, organs can become damaged, possibly resulting in severe consequences like mental or behavioral changes, loss of motor skills (like walking or balance), or even a heart attack. Kids who are having issues breathing may need additional medical treatment such as antibiotics for pneumonia or breathing treatment or even be hospitalized to ensure they are getting enough oxygen. These signs can indicate meningitis or swelling around the brain and spine which can have a long-term or even fatal effect on kids. If your child can’t tell you if their head hurts or if you aren’t sure if their neck is stiff, see if their chin can touch their chest. Gently tilt their head forward, and if it can’t reach, this could be a sign of meningitis, and parents and caretakers should seek immediate medical attention. Many parents know to look out for dehydration when their children have a stomach bug but might not think about it with respiratory illnesses like the flu. Some kids (though not all) vomit when they have the flu, making it that much more important to be vigilant about your child’s hydration. Often, the flu can make kids very tired and want to sleep all day and all night until they recover—something that can be made worse by dehydration. In between bouts of sleep, children should try to take small sips of clear liquids (or in the case of infants, breastmilk or formula) to ensure they’re getting enough fluids. If you don't know if your child is dehydrated, one way to check is to keep an eye on the number of times they go to the bathroom and the color of their urine. If the child is going less often than normal and/or the urine is dark yellow, then it’s possible your child isn’t getting enough fluids. Other signs of dehydration to watch out for include dry lips, pale hands and feet, sunken eyes, and crying without tears. If those signs appear, your child’s medical provider may want to see your child or direct you to a hospital or other location to receive IV fluids. When you don’t feel good, it can be hard to stay your happy, go-lucky self. But the aches and pains that come with flu can make even the most easy-going person a grump. For most kids, cuddling in bed or on the couch can go a long way to easing the achy symptoms of the flu. That being said, if your child is so irritable that they don’t want to be held or for you to even touch them, that could be a sign something is seriously wrong and you should call your child’s medical provider to let them know. The flu can cause bad headaches and aches all over your body, not to mention a fever and bout of fatigue that can sap every last bit of energy. But there’s a difference between not feeling up to playing because you don’t feel good and being unresponsive. If a normally very interactive child isn’t answering any questions, or you can’t wake them up from a nap, call the doctor immediately. A relapse could be an indication that your child has a secondary infection or complication as a result of the flu, such as pneumonia. If your child gets sick again shortly after they showed signs of getting better, check with your healthcare provider as soon as you notice the change. Two critical medical interventions can help kids and adults recover from flu faster and avoid hospitalization or death: vaccination and antivirals. According to the Centers for Disease Control and Prevention and the American Academy of Pediatrics, getting vaccinated is one of the most important things you can do to protect your children from a serious or fatal case of the flu. That’s because getting vaccinated helps your child’s body build up defenses they need to fight the flu. In many cases, those defenses are enough to prevent them from getting the flu altogether, but even when it’s not (and they get sick anyway), it can give them enough of a head start to slow the virus down. Without vaccination, it can often take weeks for your body to build up enough defenses to fight off an infection with the flu. In the meantime, the virus can cause serious damage. Getting vaccinated cuts a healthy child’s risk of dying from the flu by two-thirds. In recent flu seasons, 4 in 5 kids who died from flu weren’t vaccinated. Even on years when the flu vaccine isn't a perfect match to that season's flu strains, vaccination can still prevent an estimated 67,000 hospitalizations and nearly two million illnesses, many of which are in children. If the flu is diagnosed within two days of symptom onset or if your child is very young, your family's healthcare provider might recommend starting them on antiviral medications. These treatments aren't a cure for the flu, but they can help keep the flu virus from spreading too far, too fast within the body, giving the immune system a chance to fight it off. This can mean being sick for less time and having less severe symptoms, as well as reducing the chances for severe complications. These medications are not recommended for everyone and are typically reserved only for those who are considered to be high-risk for complications from the flu. They also aren't a replacement for the flu vaccine. But they can be a helpful tool to reducing the risk of hospitalization or death, especially in young children and older adults. Centers for Disease Control and Prevention. Estimating Seasonal Influenza-Associated Deaths in the United States. Centers for Disease Control and Prevention. Flu Symptoms & Complications. Centers for Disease Control and Prevention. The Flu: What to Do If You Get Sick. Rolfes MA, Foppa IM, Garg S, Flannery B, Brammer L, Singleton JA, et al. Estimated Influenza Illnesses, Medical Visits, Hospitalizations, and Deaths Averted by Vaccination in the United States. Centers for Disease Control and Prevention.